If you've just discovered the joys of walking, you may be throwing yourself into it wholeheartedly. And, generally speaking, that's a good thing. But there does come a point where getting "too much of a good thing" may be harmful if you've not been properly conditioned. While people tend to think of walking as a recreational activity rather than a sport, the aims are the same as with any other form of exercise: to improve your strength, endurance, and cardiovascular health. Overexerting yourself to get fitter faster only serves to increase your risk of injury and burnout. In order to reap the benefits of walking, you need to exercise good judgment and design a program that allows you to increase the volume and intensity of your workout gradually. When embarking on an exercise program, especially if you have never trained before, it's important to start slowly and gradually build up your time and intensity. A good strategy for beginners is to start with no more than 15 minutes of walking at a relatively easy pace (to where you can speak in full sentences without breathing heavily). Thereafter, add a few minutes each week, building up to 30 minutes of walking at a brisk pace (to where you can speak in full sentences but are breathing through the mouth rather than the nose). To attain the full benefits of walking, you should walk no less than three days a week. Anything less will fail to deliver the gains you desire, either in terms of strength, endurance, or weight loss. The rules apply even if you are over there age 65. In addition to walking, you should engage in other forms of exercise, including strength training, flexibility exercises, and balance exercises. While this may seem like a lot, many of the exercises can be done at home and would only take 8 to 10 hours of your time per week. Compare that to the amount of time you spend in front of the TV, and you'll realize that the benefits of exercise far outweigh the minimal investment in time. A common mistake when starting a walking program is to do too much too soon. Although it is admirable to want to change your life for the better, you'd be well served to take your time and learn how to walk properly for the first couple of weeks. And despite what some may tell you, there is a correct way to walk. Proper walking technique involves the correct posture, stride length, foot placement, and footwear. Getting this right can help alleviate stress to your ankles, knees, hips, and lower back and reduce the risk of inflammation and delayed-onset muscle soreness (DOMS). Walking too fast. Until you are in better physical shape, avoid walking so fast that you are unable to speak in full sentences. Walking too far: Even if you feel great when you first start walking, remember that you have to turn around and come home. Start with 15-minutes walks and increase only after you can do so comfortably. Ignoring your heart rate. Whatever your age, don't allow your heart rate to rise above 50 percent of your maximum heart rate (MHR). To estimate your MHR, subtract your age from 220. If you are 60, your heart rate should be at or below (200 - 60 x 50% = 70 beats per minute). Always speak with your doctor before starting any training program, including walking. Doing so can help you identify your physical limitations and avoid potential harms. Overtraining also affects your ability to exercise. People who overtrain fatigue quickly. Even at a slower pace, you may find yourself gasping and unable to speak in full sentences. It is at this stage that you need to stop and speak with your doctor to help guide your recovery. Alternate easy and hard days. Any hard workout day should be followed by either an easy day or a rest day. You can focus on stretching and flexibility or take an easy stroll with friends. Breaking things up gives your body a chance to recover. Always warm up. Don't break into a stride without taking at least 5 to 10 minutes to stretch your calves, hamstrings, groin, and ankles. Also take the time to cool down, especially if you've had a long walk. Keep consistent. By maintaining a regular walking schedule, you will eventually turn walking into a habit and feel strange if you miss a workout. Consistentency is the key to success. Most importantly, listen to your body. If you experience pain, shortness of breath, dizziness, a cold sweat, or sudden changes in heart rate, do no push through. Stop and contact your doctor. None of these symptoms should ever be considered normal. Chodzko-Zajko, W.; Proctor, D.; Singh, M. et al. 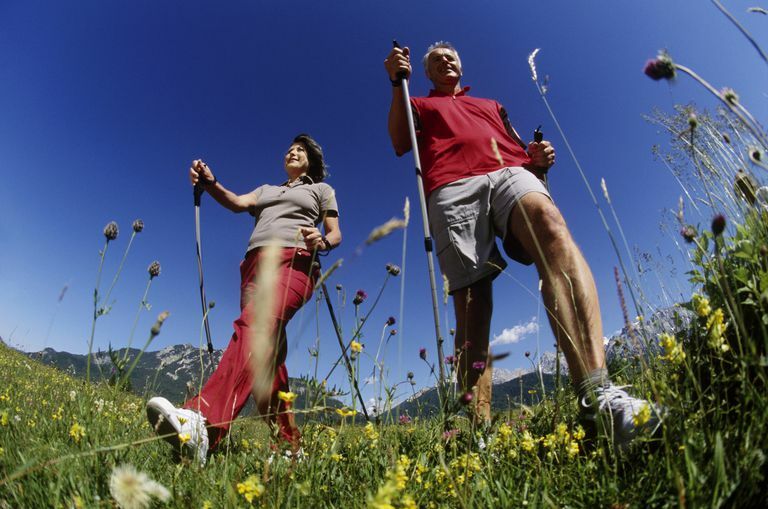 Exercise and Physical Activity for Older Adults. Med Sci Sports Exerc. 2009;41(7):1510-30. DOI: 10.1249/mss.0b013e3181a0c95c.